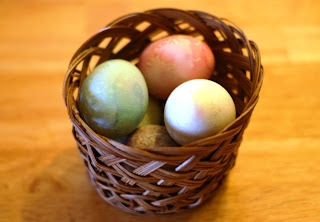 Since I gravitate towards all things natural using natural dyes is something I have been wanting to do for a while . . . I just never found the time. You can search the internet, there are many websites that talk about using natural dyes for Easter Eggs so a quick search should provide you with a lot of info. 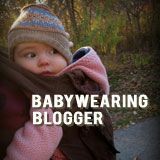 The best site I found was Peaceful Parenting I like everything else she talks about so of course her natural dye info is my favorite. She also tells you what items will make what colors so it gives a lot of great ideas. I didn't want to have to buy anything special, I wanted to use what we had on hand. So I found some frozen Raspberries, Paprika, Grape Juice, Chlorophyll, Red Cabbage, Orange Peels and Carrots. I also found some Canned Beets that apparently my Mother In Law had bought and left in our cabinets. 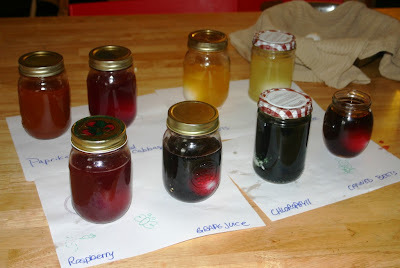 One thing to remember when using natural dyes . . . they are not for kids who like instant gratification. It takes time for the eggs to take the color of the natural dyes, I mean like hours. 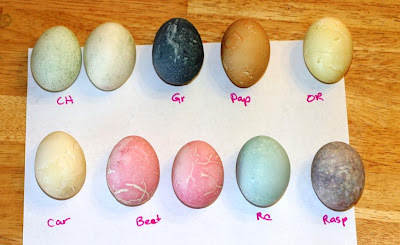 So if your kids want to be able to dunk 1/2 an egg in one color and the other 1/2 in another color then they may not like natural dyes so much. My kids got a kick out of making the dyes and didn't mind waiting for the colors. An idea, if you have a kid who wants immediate results, is to mash up some frozen fruit (raspberry, blueberry etc) give them a little paintbrush and let them paint their eggs. I think we'll try that too next time. 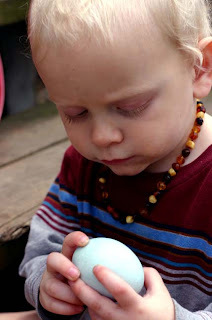 For a change we did try to write on a few of the eggs with some wax before dying, but it didn't really work well. 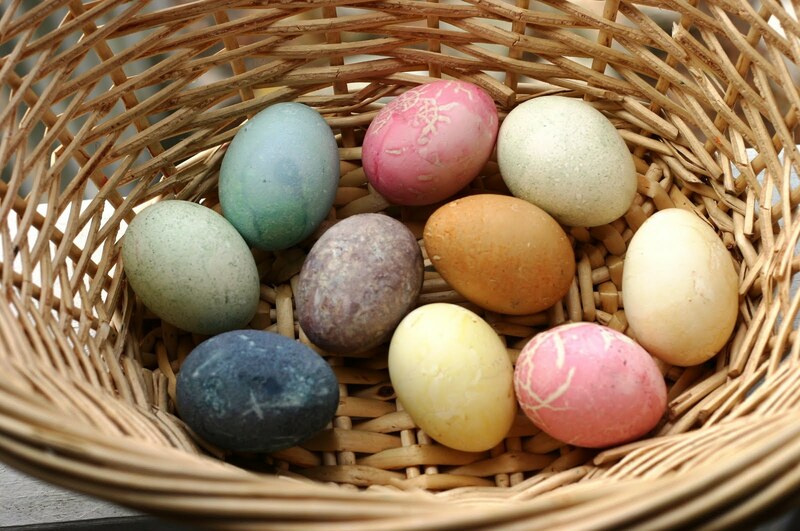 The first thing we did was wash the boiled eggs in soapy water to get off any residue that may prevent the egg from taking the dye. 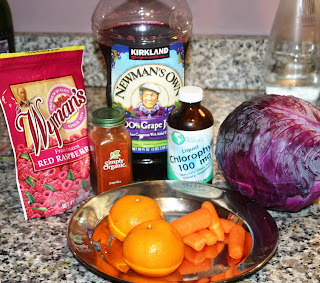 Next I shredded up the red cabbage and carrots, in hopes that that would help them release dye in the water better. Then I boiled the carrots, orange peels, paprika, red cabbage and frozen raspberries in water. I used a couple cups of water but didn't really measure how of the natural material I used, I mostly just guessed what I thought would be a good amount. I brought the water to a boil then simmered it for 20min or so, till the water was full of color. The orange and carrots made water that was only slightly colored so I let them sit longer. Eventually I got tired of waiting and just strained them out and used the water anyway. I filled jars with a cup or 2 of the colored water. For the grape juice I added straight juice. With the chlorophyll I added like 1tbsp per cup of water (I am cheap and didn't want to use too much, but more would have worked better) and for the canned beats I just strained the liquid straight from the can into my jar. I then added about 1-2 tbsp of white vinegar to each jar (about 1tbsp or I think I did a bit more than that per cup) and after each kid had chosen what colors they wanted, we added the eggs. I checked them after an hour or so but they weren't very colored. I think we let them sit somewhere between 4-6 hrs. But you can leave them overnight if wanted (just stick them in the fridge). They didn't seem very dark but we were impatient and went ahead and pulled them out. Make sure you don't touch them too much as they dry or the color can rub off some. When I pulled them out of the dye the color was quite subtle, but as they sat out to dry, and we came back to look at them, I swear the color seemed richer and darker. I think the canned beet juice gave the quickest and richest color. Raspberry wasn't red, it was more of a dirty plumb and the red cabbage dried to a nice blue. The Paprika was a brownish orange and the chlorophyll would have been darker had I used more, but it had nice green speckling. The carrot and orange peel actually made a nice light orange/yellow color which was surprising because the dye water for those 2 was really light. What I found interesting was that the eggs that were put in the fruit juice, the Raspberry and Grape Juice, had this film on them . . . like grainy and almost bubbly as I pulled them out of the dye water. I am not sure why, but I didn't rub it off, just let it dry (see below). If I had wiped it off the color would not have been as dark, but equally pretty I think. 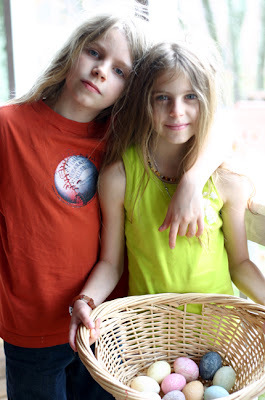 Overall the kids enjoyed it, and I enjoyed that it was natural and cheap and something we could just do ourselves. 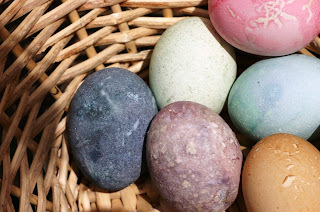 I really loved the subtle, beautiful, natural colors, and I didn't cringe as the kids peeled the shells off and the egg inside was dyed too . . . like I do with the artificial dyes. So I think we will definitely make this a regular part of our Easter decorating.